In this final installment on how Christianity interacts with a pluralistic culture, I want to start with a story. But all of that has changed. We moderns no longer have to huddle around fires telling fanciful myths about creations, floods, trials, conquests, and hoped-for paradises. Science, industry, rationality, and technology have dispelled the darkness and ignorance that once held the human race captive to its fanciful fables. Today, through progress, enlightenment, and cultural evolution, we now possess positive knowledge, scientific facts, rational analyses. We no longer need to be a people of ballads and legends, for we are a people of periodic tables, technical manuals, genetic maps, and computer codes….We have left behind myths and legends….Indeed, by struggling to break out of the fear and ignorance of our ancestral myth-making past into the clear daylight of rational, scientific knowledge, we have opened up for the human race a future of greater prosperity, longevity, and happiness. After the last three days of posts, you might get the sense that I think I know a whole lot more than I do. Well, that very well may be true. I guess only time will tell. But if you get the feeling that I think I know everything….I will respectfully disagree. (Bummer for me though.) In fact, an essential part of my belief in God is that he is incomprehensible. And if I can’t know everything about him, there’s sure to be more about this world I am quite ignorant about. Yesterday, I suggested that while a pluralistic attitude toward religion (i.e. saying that all religions are equally in the dark about ultimate things) is admirably humble, it is also deeply flawed. It turns out that while the pluralist says, “No single religion or worldview can get to the whole truth. 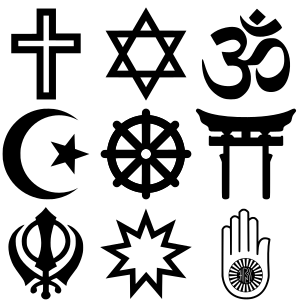 So we should all just reject authoritative dogma and accept each others’ positions,” they are, at the same time, contradicting all those religions (like Christianity, Islam, various forms of Buddhism, etc.) that do make claims to ultimate truth. In fact, what the pluralist is doing is exactly what they tell others not to do–they are saying that their worldview encompasses and explains all other worldviews.